Designed for schools and rehearsal areas, the Yamaha P22 model school piano is often chosen by experienced pianists for both home and professional use. It was built in 1997 and played very little so it has minimal amounts of wear in the action. The structural condition is excellent. The cabinet has some patina, but good otherwise. The bass tones are particularly robust. The treble sings and is clear and bell-like. The touch is classic Yamaha; accurate, fast and responsive. We have regulated the action so it performs optimally. It was purchased new here in Albuquerque so it is happily acclimated to our unique humidity levels. We will warrant the piano for two years. Yamaha professional uprights are widely used in the practice rooms of music schools due to their durability. 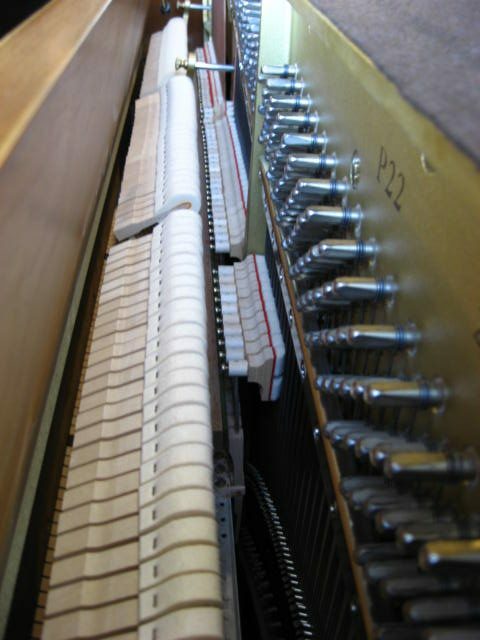 A practice room piano can be played for hours every day of the school week, for decades. They have a reputation for being low maintenance. This saves the Institution money of course. But it also insures that the music students are practicing on an in-tune instrument that responds well mechanically. They are designed and constructed well and are reliably sturdy and stable in adverse environments. This makes them favorites of professional musicians at home and work. Built in the USA, the Yamaha model P22 studio upright piano cabinetry is suitable for a formal home décor. It has a stately, handsome appearance and traditional American look. The cabinet is finished in oak veneers with a satin lacquer finish. Oak is a hard-wood and chosen for its durability in public settings like schools. It has an ample-sized music desk that can accommodate larger music books or multi-page musical charts or scores. The original bench with storage is included. There is a fallboard lock to protect the keys and a lid lock to restrict access to the inside. The fallboard is the two-piece folding “Boston” type that is more secure and won’t slam shut. 88 Keys Piano Warehouse pricing – $3450. New Yamaha P22 price – $7549. Oak cabinetry adorns the Yamaha P22 model School Piano.